First small groups and communities were forming first of all around the researchers of Russian folklore and handicrafts, ethnographers, artists and historians. Most prominent of them were Vseslav Svyatozar (G. Yakutovskiy), А. Asov, Selidor (A. Belov), Mezghir'(А. Рotapov), Velimir (N. Speranskiy), Velemudr, Boghumil (V. Golyakov), Dobroslav. Their views sometimes differed but still they have formed the backbone of the modern ideology of present day Slavonic paganism. The roots of pagan revival can be traced as far back as the pre-Revolutionary Russia. They can be found in the works of A. K Tolstoy, A. N. Tolstoy, V. Vasnetsov, K. Rerikh, I. Bilibin, I. Stravinsky, A. Afanasyev and others engaged in the studies of folk handicrafts, art and folklore. One of the factors of popular attraction to the movement was the appearance of Russian "fantasy" - a trend in popular fiction based on pagan outlook as seen by the present day person. The books by Yu. Nikitin is a good example. The books deal with the deeds of heroes against the background of pre-Christian Russia. The main idea is the declaration of pagan ideals of "fairness" as the most becoming the image of "true male". The pre-Christian period is being proclaimed a kind of "Golden Age" of Russia. The books actually reflect the existing mass sympathy with the things pagan among the reading young generation as they are being published in hundreds of thousands' editions and attract more and more people to the pre-Christian Tradition. Internet is also of great importance in broadening contacts between the followers of the Tradition. There are a number of traditionalist sites offering a wide spectrum of literature from primary sources, chronicles and sermons against the paganism to the works of modern supporters of pre-Christian Tradition. Various forums where pagans discuss the topics of interest help spread the movement in the country. According to the poll conducted by "NG-Religion" in December 2001, more than 20 % of Russian believers using Internet practice paganism. Most popular books dealing with the topic are "Paganism in Ancient Russia" by B. A. Rybakov, "Paganism of Ancient Slavs" by V. V. Sedov, "Slavs and Russia. Issues and Ideas" by A.G. Kuz'min, "Our Own Gods" by I. Cherkasov (Veleslav), "Gods of the Slavs. Paganism. Tradition" by D. A. Gavrilov and A. E. Nagovitsin. Also very popular are the issues of "Myths and Magic of Indo-Europeans" Anthology edited by A. Platov (Yggwolod) who also authored a number of popular books on the Northern Tradition and "Kolovorot" commented calendars, published by Consciousness Ecology Community "Krina" (St. Petersburg) for ten years running. One of the first books that started the unification of modern pagans in the early 90-s was "Iznachaliye" ("Primary Bond") by A. Belov, the founder of the Association of Slavonic-Goritsa Wrestling. "Vyatichi's Kolyada", one of the oldest Russian traditionalists groups, is among the organizers of the number of international congresses held by WCER (World Congress of Ethnic Religions). Contrary to the existing opinion Russian traditionalists do not oppose Orthodox Christian Church and have never been engaged in whipping up chauvinistic feelings among the population. The majority of organized traditionalist groups follow the ideology of religious tolerance aimed at unification of all the nations living in Russia. Below are the extracts from the fundamental document of The Circle of Pagan Tradition, the biggest and most influential association of the followers of national pre-Christian Tradition. Founded in March 2002, The Circle unites several dozens of groups from various Russian towns (Moscow, St. Petersburg, Ryazan, Kaluga, Tula, Podol'sk, Dolgoprudniy, Troitsk, Vladimir, Penza, Nizhniy Novgorod, Kaliningrad, Kazan, Blagoveshchensk, Barnaul and others) and from abroad (Scandinavia - "LokasvartLogi", "Iggulfar", "Skalldskapr", "Hamindja", and the Ukraine - "Volhovarn", "Great Fire"). In 2003 The Circle has received the support of the President of WCER and of the officially elected High Priest Krive (Jonas Trinkunas of Lithuania). BR> The Circle was founded by the leaders of traditionalist groups from Moscow and Moscow Region: "Ber's Circle" (Velemudr, Yggeld, Ogneyar, Veledor), "Vyatichi's Kolyada" (Velimir, Mezghir'), "Kupala" (Vseslav Svyatozar), "Moscow Slavonic Pagan Community" (Mlad, Rodoslav, Ratimir), "Slaviya" (Lyubomir, Vereya), "Four Apple-Trees" (Ratoslav, Raunesverd, Jy), "River-heads"(Velena), "Vyatichi" (Velegast), "Moscow Community of Veles" (Velemir), and other leaders. The leaders of the traditionalist groups form the Council coordinating their activities. Along with the new urban pagan communities and groups there are still existing in Russia whole villages following original pre-Christian way of life. Among the members of the Council is A. Rybin representing one of such villages - Nizhegorodskiy Purgas Community. The followers of pre-Christian Tradition participate in archaeological expeditions studying religious sites of ancient Slavs and Ugro-Finns. Exploratory trips in Russia and abroad are conducted with the aim of gathering ethnic materials, such as folklore songs and rites, incantations, ceremonies. The activities of the groups are led by the so called "Bitza Appeal", extracts from which can be found below. "1.0. When we speak about our Faith we often use different words for one and the same thing. It often creates impression of disaccord between us and sometimes leads to senseless animosity. But different words just describe different sides of one and the same thing - our Faith, our Creed. One of its main features placing it apart from others is that our Faith is natural, Vedic and pagan. In Russian words meaning "pagan" and "language" have the same base. "Language" in ancient Russian meant also, as we can see from old chronicles, "tribe" or "people". So, paganism for The Slavs is the natural, folk, original Tradition. V. Dahl in his dictionary gives the following explanation to Russian word "language": "...people or land populated with the people of similar tribal origin, speaking the same language". So paganism is the original tribal, ancestral faith and our forefathers have always considered it to be the faith of our predecessors. 1.5 Nowadays the powers-that-be through the mass media declare that there are only three accepted traditional faiths in Russia - Orthodox Christianity, Islam and Judaism. We say that this is a violation of the Constitution and acting laws, namely the Law on the Liberty of Conscience. ... We have no right to wander off to our "national flats", houses, villages and towns. We must be united for we are facing the amalgamation of state institutions with the Russian Orthodox Church and the threat of turning the secular state into a criminal-ecclesiastical one. We also must be united in the face of yet another threat - the threat of nationalistic-chauvinist revenge, the return of the ideology condemned by the Nuremberg Tribunal. Those signing the present Appeal declare the actual existence of a wide social movement of free citizens and non-formal associations, that is called "Pagan Tradition - Rodnoveriye (Native Faith)" existing on the basis of commonness of world-outlook, religious position included. 2.1. 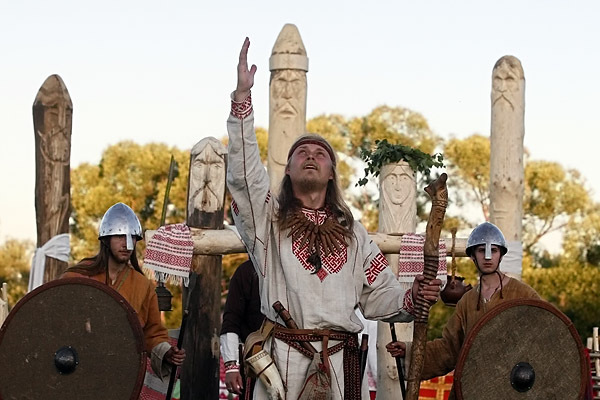 The Pagan Tradition of the Slavs (Rodnoveriye) as the Paganism and Pagan Tradition in general has never known the concept of "nation". As the world-outlook and original folk belief it had appeared and existed for thousands of years before the moment in human history when, in the 17th century, first nations appeared. The Paganism always knew and accepted the concept of "people" and first of all not as biological but more as a cultural entity. There is no possibility of national discord among the true followers of one Pagan Tradition. Under Paganism there is no possibility of forming a state based on national or religious intolerance. National-chauvinists try to use the symbols of Paganism to their own unseemly ends. They form their organizations on the basis of "true Aryan" notion but try to cover behind the blessed names of our gods. We know of such facts and will give due assessment of them in this document. The love to their land, the attitude to the Powers of the World as to the living Entities, i.e. Gods, esteem of the gods - the predecessors of the kin, historical and spiritual predecessors should bring together the peoples living in one land. 2.2. We want to stress that a number of extremely nationalistic and chauvinistic associations of Russia and their movements tend to follow monotheistic religions, namely the religions of Abrahamitic type, such as orthodox Christianity. Much too often nowadays we can hear near-sighted politicians stating that "all Russians are Orthodox Christians and if someone is not a Christian then he is not Russian". These false ideas violate the right of the citizens of Russia to liberty of conscience and are aimed at whipping up national and religious discord, at weakening our Motherland. 2.4. The followers of Slavonic Pagan Tradition (Rodnoveriye) reject national-chauvinism. We will never accept the authority of any "god-chosen" nation, no matter what the name (we also reject any world dictatorship of any superpower). We will never declare the Slavs to be such a "god-chosen" people with some great mission that will justify humiliation or subjugation of other cultures. Each culture has a value in itself and has a right to development unless it starts infringing upon the culture of other people, unless its name is used to justify injustice, for at that moment it ceases to be a culture. 2.9. To implement the goals stated in the present Appeal its participants deem possible raising the question of creation in the future of an officially registered public Pagan movement (and, as a possibility, religious confession on its basis). We are aware that this task cannot be fulfilled in a day or even a year. We will proceed to implement it taking into consideration the current situation and without any infringement on the rights and interests of all participants of Bitza Appeal and those who support it..."
The aim proclaimed by the participants of the movement is "the resurrection and widest possible spreading of pre-Christian tradition, acceptance of it by public and state as original, traditional faith and world-outlook. The leaders of the movement stress the desire of traditionalists to preserve religious tolerance and prevent religious persecution. The participants of the movement believe that pre-Christian Tradition is the very ideology and world-outlook that can save Russia from spiritual crisis born by disenchantment with the ideals of the Soviet past.